If you’re looking for something gastronomically fun to do and ready to indulge with delicious dishes, wines, cocktails and beers, then you should go to the 2017 Greenwich Wine + Food Festival in Greenwich, CT! This year’s fun festival is presented by Serendipity magazine for the benefit of the Mario Batali Foundation, the Friends of James Beard Benefits and the Town of Greenwich Parks and Recreation Foundation. 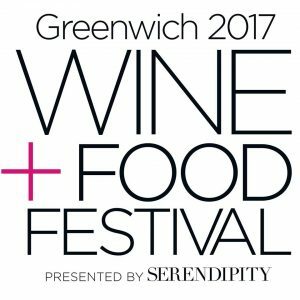 The 2017 Greenwich Wine + Food Festival is a multi-day event that celebrates the area’s rich culinary landscape, and showcases innovation in the food and beverage industries. Sponsors of the festival include 1893 Cola, 90+ Cellars, Aitoro, Alfa Romeo, Angela Swift of Houlihan Lawrence, Ashforth, Blancpain, Bender, Brockman’s Gin, Budweiser, Caesar Stone, Chelsea Piers, Citi, Coldwell Banker, CPG Architects, Culinary Works, Dacor, Deane Rooms Everlasting, Delamar, Deutsch Family Wine & Spirits, Don Julio, Ethan Allen, Empire City Casino, Hospital for Special Surgery, JHouse, Manfredi, Marriott Stamford, Mionetto, New York Post, NuKitchens, Ketel One, PepsiCo, Rhone, Rudy’s Executive Transportation, Starr Tent, Stella Artois, Sysco, Tea House Collection, Val’s Putnam Wine & Liquors, Whole Foods Market, Westy, Woodford Reserve, Wüsthof and Barbara Zaccagnini. * For more information, visit www.greenwichwineandfood.com. I’ll be attending the festival on Saturday and looking forward to seeing celebrity chefs Mario Batali, Scott Conant, Alex Guarnaschelli and Adam Richman. They will conduct cooking demos and book signings. I hope that I’ll manage to take their pictures and talk to them! The event will be held rain or shine, and anyone under 21, including infants or strollers, will not be admitted. Animals are also not permitted. You can find the full schedule of the day’s events here. Keep in mind that it’s subject to change.